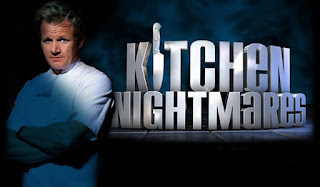 Lately I’ve become hopelessly addicted to Fox’s Kitchen Nightmares. It’s another one of those ridiculous food reality shows sporting a celebrity chef (Gordon Ramsay) that is almost too much fun to handle. The show is in its third season and I’ve just started taping the reruns so I can catch up, but if you haven’t had a chance to see what it’s all about, let me give you a preview. Some nitwit decides to open a restaurant. Because they don’t know what the hell they’re doing, they operate in the red until they've made it most of the way through their life's savings. Enter Gordon Ramsay, here to save the day. He samples the menu (everything is terrible), sending all the items back and occasionally spitting out some of the food. Ramsay then tours the kitchen, usually finding something appalling such as mold or spoiled meat, and Ramsay says something like: “bleep bleepin’ filthy, bleep bleepity bleep is disgusting,” and then makes everyone scour the place until its nice and shiny. Then we’re treated to a few minutes of watching the establishment operate for a night, with the owners and management standing around acting like they’ve never seen the place before. Ramsay proceeds to change the menu; this makes the already stubborn restaurant owners/chefs suddenly become more defensive—even though they’re the ones that asked for help in the first place. Maybe their old ways weren’t so bad after all? I mean, what’s a little salmonella between friends? Then Ramsay says something like: “Bleep you bleepin’ idiot, bleep bleepity bleep.” Restaurant gets a makeover. Re-opening night has one last little bit of drama, and then everyone in the kitchen gets their bleep together. Restaurant is saved. Repeat. There, now you’ve seen just about every episode of Kitchen Nightmares. Predictable, and yet so irresistible. I can’t stop watching the bleepin’ show.